Parenthood takes a toll on any parent. Learn the 8 warning signs you need to be a patient mom (and what to do to fix it). It happens often, at predictable times. I hop on the computer to look for recipes when my kids interrupt and ask me to fix a broken toy. Other times, they’ll whine or complain within minutes of getting picked up from school (not exactly a great start to our afternoon). It could even be when they’re being silly and loud—they’re not even doing anything wrong—and it still happens. And I lose my patience. Mornings aren’t always the easiest for any family with young kids. You’re scrambling to get everyone up and dressed, preparing breakfast, packing lunches and driving them to school. Then it’s straight to work for several hours, only to come home and prepare dinner, wash your pump parts and do household chores. And it’s not like the kids are sitting quietly and behaving all this time. No, they’re fighting, throwing tantrums and making the hours even longer. Once you’ve finally put them to bed, it’s time to pack for the next work day and do more chores before finally crashing to sleep. For many of us, this is an all-too-familiar scene in our homes. We get no breaks. Life feels like a long string of “trying to survive” and wondering when we’ll actually get to sit down and enjoy this parenthood thing. In certain seasons of our lives, this is simply how it is. We don’t get the same amount of breaks caring for a newborn as we would a five-year-old. Maybe you’re an accountant and it’s tax season, or you’re gearing up for the hectic holiday months. But having no breaks doesn’t make us better parents. We can’t think clearly, show empathy to our kids or dig deeper into why our kids might be behaving this way. All we see is that they’re yet another nuisance to our day. The times when you feel like you get no breaks is when you really need to take one. Breaks can take many forms. 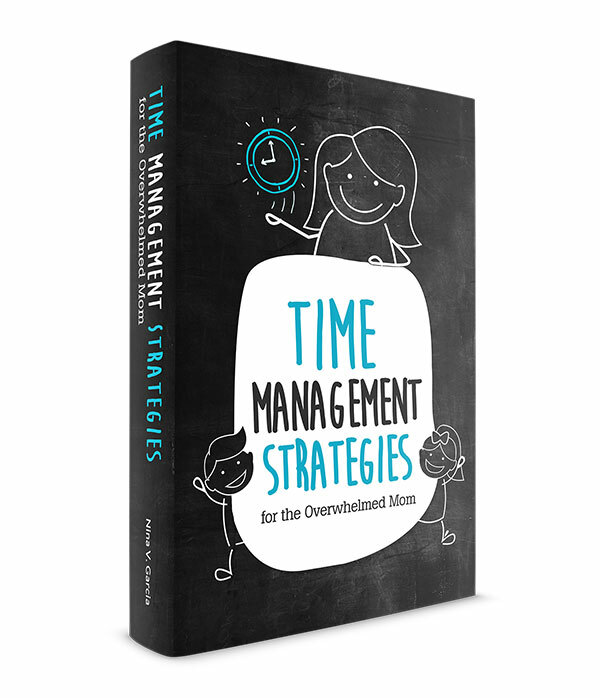 A five-minute break in your room can be all you need to emerge much calmer and less likely to yell at your kids. A consistent commitment to a hobby like daily morning runs or monthly dinners with friends can also do the trick. Other times, it’s being with your family in a new setting, like taking a day trip together instead of running errand after errand. Then, see what part of your life can change to make more regular space for breaks. Little things like waking up earlier than the kids so you can get things done before they need you, or bigger changes like looking for a job closer to home. You’re barely able to get a break, much less feel purposeful or organized. Whether it’s caring for your sick child or realizing you have to work overtime again, feeling overwhelmed doesn’t make for a patient mom. After all, who can be patient with her child’s antics when there are so many things to do? When you can’t seem to check off your to-do list, much less attend to big-picture tasks you’ve been meaning to tackle. When you’re distracted and have no long stretches to focus. I’ve learned the value of single-tasking and focusing on only the one thing in front of you. Don’t think about all the other tasks you need to do, just the first thing you need to before moving on to the next. If your brain feels like it’s going to explode from holding so much information of things to do, make a list. Whether physical like a planner (I use an Erin Condren Life Planner) or digital like your phone, get these thoughts out of your brain so you can focus on the task at hand. Once you finish that, then refer to your list and start on the next item. Be present when you do these tasks so you do them right the first time and accomplish more with the time you have. And plan ahead for what you’ll need. Nothing is worse than scrambling right before you need to get something done or get out the door. If you know your child will be at grandma’s tomorrow, get the diaper bag ready with almost everything you’ll need to pack. Not only do you feel like you have no time, you also rush through whatever few minutes or hours you have. It seems like you just picked up the kids from school, and now it’s already five o’clock and they’re hungry for dinner. You’re also more likely to make mistakes. You forget to pack the milk or don’t make an appointment with the dentist like you’d been meaning to. And you don’t get to experience life and enjoy it. Your days seem to zip by at full speed with you barely hanging on for the ride. So when your kids want to read a book, you get irritated at yet another distraction right when we needed to focus. Or when they bicker and fight, you’re less likely to guide them through their conflict and instead threaten to throw away all their toys. First, slow down. Literally slow your actions down. Don’t think about all the other things you have to do, as that only makes your actions more erratic and stressed. Then, remind yourself that it’s not that big of a deal. In most cases, the things we’re stressed about aren’t as terrible as we make them out to be. So what if the kids eat at 5:15 instead 5pm or you’re running late to school (you’re already late anyway—might as well drive safely)? And finally, think about scaling back. Where in your life can you simplify? Do you need to stop volunteering at the school for a while, or space out your home remodeling a bit more? Can you buy pre-packaged, healthy snacks for lunch you can toss into your kids’ lunch bags? Slowing down, reminding yourself it’s not a big deal and scaling back will help you feel less rushed and more carefree. Read how to be more carefree in parenthood. Do you feel tired, even after you’ve already had your morning coffee? Feeling overtired and groggy throughout the day doesn’t make for being a patient mom. You’re not as alert as you can be, and aren’t able to think clearly or with your child’s best intentions. You’re also going through the motions, willing the clock to move faster so you can put them to bed already and get a moment to yourself. This may seem obvious, but get as much sleep as you can. Depending on your season (the newborn stage doesn’t lend itself well to sleep), make rest a priority. Yes, those after bedtime hours are the only opportunities you get to have time to yourself. But dedicate part of that time, no matter how little it may already seem, to going to bed sooner. Don’t push yourself to stay up even later if you can help it. And wake up earlier. Those morning hours can be brutal when you’re waking up alongside your kids. You can barely think about how to dress them and which breakfast to prepare, much less be the patient mom you want to be. Learn how to cope when you feel tired all the time. 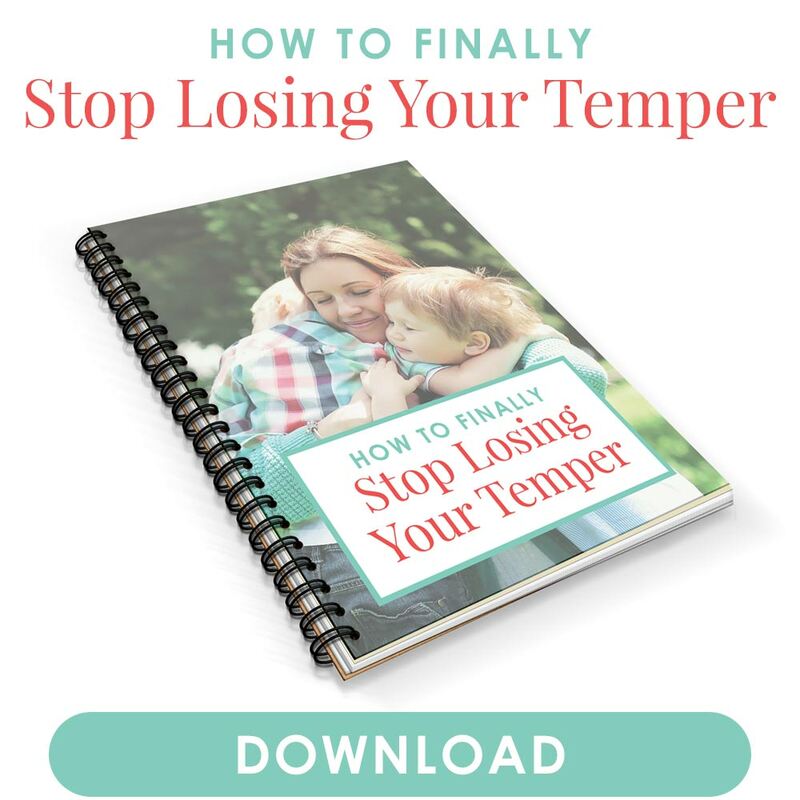 From yelling above the chaos of your home to losing your temper, yelling is a sign you’re not being the patient mom your kids need. Yelling is never pleasant for anyone, or effective for that matter. Sure, you might get your kids to cooperate, but out of fear and submission without considering their point of view. And it’ll be less “effective” the more you do it. It also doesn’t help that yelling feels “gratifying” at first. You release pent-up frustration, but the remorse and its effects are immediate and terrible for either person. I never considered myself the “yelling type,” and for several years I hardly yelled at my son. But toward the end of my twin pregnancy and once the babies were born, I was yelling more often than I ever did. And it seemed to just erupt out of me. Whereas I was able to think before acting, I was yelling the minute the triggers that caused me to yell happened. Other times, I yelled because I felt like that was the only thing that would get my kids to listen. Imagine that someone is watching. Picture a friend or family member sitting nearby, or even imagine you’re on camera that researchers would later use to study. Thinking you have an audience keeps your anger in check and allows you to think more clearly about a better way to respond. Practice how to react calmly. Before getting angry at my kids, I imagined how I’d want to react and the attitude I should have. When those triggers happened, I felt better prepared to deal with them. Develop a plan. It’s likely you yell at predictable times, such as when the kids fight over the same toy or whine about not wanting to take a bath. If so, develop a plan to rely on once those episodes happen. You might tell yourself, You’ll likely get irritated when they fight over the same truck again. If they do, you won’t yell. Instead, you’ll encourage them to take turns. You’ll even using the timer to give each child five minutes at a time with the toy. Read even more effective techniques to stop yelling at your kids. You expect your kids to have a perfect track record and give them a hard time when they whine about going to school or throw a tantrum, never mind that they haven’t done either in a while. Other times, you forget that their behavior is actually normal for their age. That they should be defying their parents and asserting themselves. That every other kid in the world has done the same thing. My kids had been putting their dishes away in the sink like clockwork, so much so that the day one of them didn’t, I gave him a big stink for it. Thankfully, my son chose to forgive my attitude and let it go, because it’s these moments when I realize I expect too much of them. Expecting too much of our kids makes us forget that they’re human and make the same mistakes you and I do. We also forget that their brains are wired to behave in certain ways. It’d be silly to imagine a two-year-old restrain himself from every misbehavior—he’s only two. First, remind yourself that your child, no matter how much he’s upsetting you, is likely behaving in a normal way. Tantrums, whining, and “ruining your day” are all normal behaviors. And second, use the opportunity to teach, not scold. Each of these moments is a chance to teach your child lessons he can learn. Maybe it’s learning how to better identify and manage his emotions, or to take turns at the playground. Think of these as opportunities to teach what you know rather than challenges to your day. Read how understanding your child’s development can make you a more patient mom. 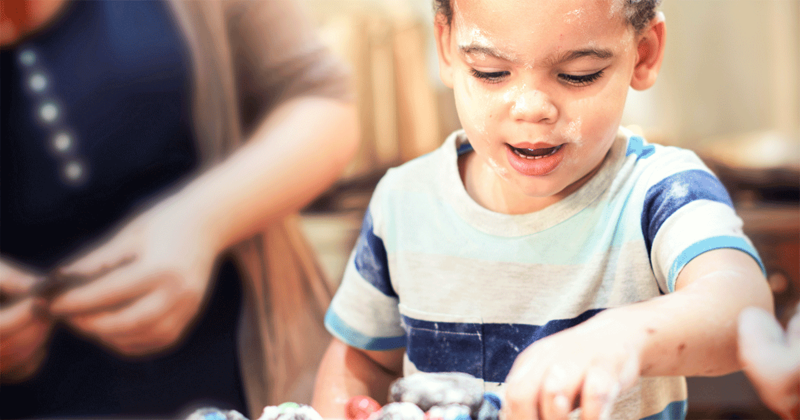 Learn how understanding your child’s development can help you be more patient. You freak out when things don’t go as you planned, like when you couldn’t go to a family party because one of your kids got sick. Dinner time becomes a battle zone when your child refuses to eat the meal you just cooked. This is understandable, especially considering how much we do for our kids, from driving them to school to blending baby food to planning summer camp. So when things don’t go according to plan, we freak out. Yes, we can control and enforce many aspects of their lives such as what time they should sleep and where we go on the weekends. But we’re left with many circumstances we can’t control: Their thoughts, their behavior, whether they get sick or have a good day at school. We also forget that the world doesn’t cater to us and our Grand Plans. I freaked out when I learned I was having twins partly because this wasn’t part of my plan (I had only wanted one more baby, not two). With most of our plans coming to fruition, it’s easy to feel like we should be able to control everything. You might think your child never behaves, or that she always cries when you leave for school. Instead, remind yourself of the many days she didn’t cry in the morning because you’ll realize she usually doesn’t. Remember the recent good things she did, proving she doesn’t “always” misbehave. Then, build into your life the expectation that some things will go wrong. That just because it’s been months since your child had a poop accident means she might likely have one at some point (and today happened to be it). From time to time, you wonder how different life would be if you decided not to have kids. You imagine having so much time to yourself, more money in your savings account and not dealing with defiance and middle of the night wake ups. It happens when your kids are acting, when the bills feel too high, or when you realize you haven’t slept a solid eight hours in years. You sometimes resent your kids for how much having them has changed you and your life. But feeling this way, especially more often than not, isn’t fair to your kids. After all, they never asked to be in this predicament. You’re also less likely to show empathy for them when you feel like they’re the cause of your frustration and sadness. We’re all bound to feel resentment at some point, but if you feel like it’s happening too often, focus on seeing things from your child’s point of view. Imagine how he sees the situation, and what he could be feeling. Then, remind yourself of all the heartwarming moments you’ve felt since becoming a mom. Be grateful for the good days you’ve had, and that despite the struggles you have, you wouldn’t trade it for anything if it meant not having them in your life. Read unfair reasons we get mad at our kids. The days when we lose patience are always hard, and on everyone too, despite how common or inevitable they may be. We feel like we have no time, much less the breaks we need. We’re rushed from one thing to the next and feel tired from all our duties. We yell more often than we’d like, and expect too much of our kids. So much so that we want to control everything, and even feel resentful toward them and parenthood. If you can relate, you’re not alone. But I’d like to think we can take steps to being a more patient mom. Take these action steps to heart and begin to make the changes you want to see. So that the kids being silly or refusing to eat their dinner won’t elicit your anger, but rather the calm presence of a more patient mom. 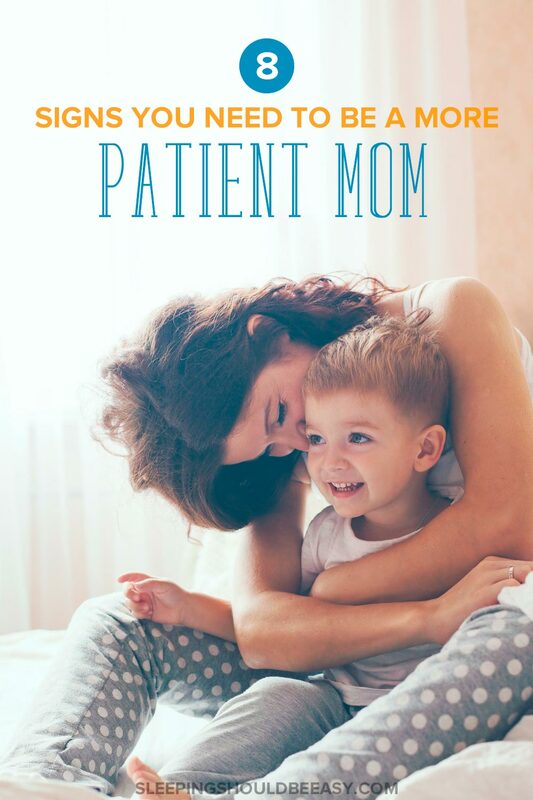 Did you like this article about being a patient mom? Share it on Pinterest and Facebook! This is so spot on for me. I just had to apologize today to my 3 1/2 year old for yelling. The tip on planning ahead I think will be key for me. It’s very predictable what my kids will do and usually when they do it I yell. I have to get better at sticking to a plan because its normal behavior and it’s going to happen! I also loved your single tasking idea. This is something I do sometimes but need to get better at. I get too overwhelmed when I think of all the things I need to do and so taking it one step at a time and not getting ahead of myself will ease that overwhelm for sure! Great post! Thanks, Christina! Thinking ahead will definitely help. Sometimes just anticipating it’ll happen and knowing it’s normal is all I need to calm down.